President Donald Trump said his trade agreement with China was “one of the largest deals ever made.” He dubbed his new accord with Canada and Mexico the “most significant, modern and balanced trade agreement in history.” And he insisted that the world leaders he’s lambasted on the world stage had become great friends. 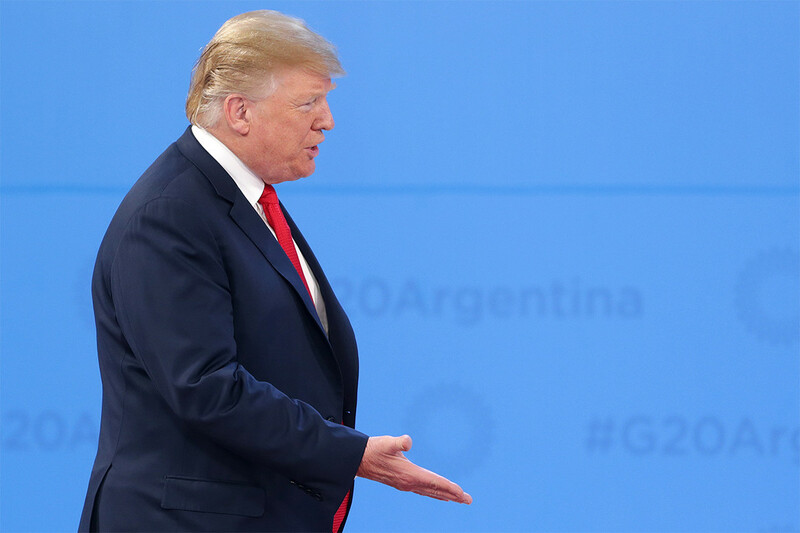 As he crisscrossed Buenos Aires, posing for photos with dignitaries and boasting about his accomplishments, Trump left behind a trail of exaggerations meant to paper over the fractious first half of his term and rebrand himself as a globe-trotting statesman. It’s the Art of the G-20, by Donald Trump. The 45th president is writing his own rulebook on how to claim credit and respect on an international stage where many leaders have looked down on him for years. But just as his famous 1987 book counseled, Trump’s global deal-making was as much about style as substance, with grandiose talk the most important ingredient of all. The president arrived back in Washington on Sunday feeling triumphant, believing his latest international trip to be a resounding success. During his overnight flight on Air Force One, Trump seemed vindicated after dealing with a long buildup of pressure to the summit in Argentina. White House aides had reason to be happy, too. The gaffe-prone president managed to avoid a diplomatic snafu and even canceled a Saturday news conference that could have sent the entire trip off the rails. He laid off Twitter for more than 24 hours until later Sunday afternoon, when he chimed in with good wishes for Hanukkah. But behind the veneer is a more complicated reality. His deal with President Xi Jinping of China was effectively an agreement to continue trying to agree. The president’s critics argue that the new North American trade agreement is little more than NAFTA 1.1. And behind all the smiles, many world leaders still have a strong distaste for Trump. Some hid their disdain better than others. Chancellor Angela Merkel, whom Trump once accused of “ruining Germany,” showed no signs of animosity during a Saturday bilateral meeting with the president in which he called her his “highly respected” friend in front of a crush of reporters and TV cameras. But Prime Minister Justin Trudeau of Canada at times looked as though he’d been taken hostage during the Friday signing of the new U.S.-Mexico-Canada trade deal, blank-faced and looking straight ahead as Trump touted their supposedly close relationship. Just hours before the signing, it wasn’t even clear whether Trudeau — who pointedly called the president by his first name during the ceremony and ignored Trump’s favored name for the agreement, USMCA, in favor of calling it the “new NAFTA” — would show up to the event. For Trump, close relationships — or the appearance of them — are everything, causing some foreign policy analysts to worry that world leaders are cultivating personal ties to the president in order to get what they want from him. This year’s Group of 20 may be as close as Trump will ever get to being embraced by the international community. Early in his presidency, Trump openly groused about having to attend such summits. But White House aides say the president has grown more confident in recent months, having built relationships with foreign leaders and beefed up his knowledge of policy issues. And while aides were braced for Trump to go off script — as he has at so many prior global gatherings — he was unusually disciplined. He spoke only briefly to Russian President Vladimir Putin, with whom he had canceled a planned meeting over new Russian aggression against Ukraine (to hear Trump tell it) or new developments in special counsel Robert Mueller’s Russia investigation (to hear the Kremlin tell it). According to the White House, Trump also exchanged just a few words with Saudi Crown Prince Mohammed bin Salman, who has been widely condemned over the October killing of Jamal Khashoggi. In either case, a chummy photo op — like the infamous image of Putin and bin Salman yukking it up with one another — would have driven media coverage of Trump’s entire trip. Instead, Trump soaked in the tacit acceptance of the world leaders who he knows have privately snickered about him. During a group photo at the start of the summit, Trump could be seen smiling and chatting with President Emmanuel Macron of France. It was a sharp contrast from his recent trip to Paris, which included a rebuke of nationalism from Macron and was overshadowed by the White House’s decision to scuttle a planned trip to an American cemetery because of bad weather. Foreign officials have learned to remain calm, focus on areas of agreement and, most important, find ways to get on Trump’s good side. There was perhaps no better example of the flattery factor than Japanese Prime Minister Shinzo Abe’s praise of Republicans’ performance in the recent elections, despite the fact that the GOP lost the House. “I’d like to congratulate you on your historic victory in the midterm election in the United States,” he said. Trump administration aides had a lot riding on the Xi dinner, which took place in a marble and stone-lined dining room just off a manicured courtyard in the president’s luxe Buenos Aires hotel. One U.S. official acknowledged privately before the dinner that a total collapse of the negotiations with China would have cast a shadow over the whole trip. In the run-up to the dinner, senior officials were seen scurrying around the president’s hotel, rushing to prep sessions. Matt Pottinger, Trump’s China policy expert and a fluent Mandarin speaker, blew by reporters shortly before the meeting. U.S. officials had been quietly negotiating with their Chinese counterparts for weeks, hashing out the details of an agreement to hold off on escalating the trade war in exchange for a pledge to continue discussions between the two nations. But even on Friday night, many White House aides didn’t know exactly how it would go, noting that both Trump and Xi were unpredictable. One White House official who spoke to POLITICO before the summit called Xi a “wild card,” adding that he was difficult to read and noting that it was often difficult to get a clear sense of what the Chinese were thinking during the pre-dinner negotiations. Though senior aides had prepped Trump ahead of the meeting, they worried he could freelance — which, ultimately, didn’t happen. While the contours of the China deal are still vague, the White House noted that the dinner resulted in one other significant concession from Xi: a promise to designate fentanyl as a controlled substance, a move that subjects people in China selling the synthetic opioid to the United States to severe penalties. White House aides hope the change will save a significant number of lives in the United States. Still, one thing seemed certain long before the dinner took place: Both sides would declare victory in almost any scenario, unless the dinner turned into a complete disaster. And that’s exactly what Trump did, with the White House releasing a statement from Air Force One that called the meeting “highly successful.” Indeed, one person familiar with the meeting said it lasted at least an hour longer than scheduled, with the delegations breaking into applause and posing for photos with each other. “This was an amazing and productive meeting with unlimited possibilities for both the United States and China,” Trump said. Zhou Xin of the South China Morning Post contributed to this report.